Basil and parsley are excellent herbs to have for an indoor garden. If it’s connecting to nature then an indoor garden is perfect for you. So get your soil ready, water, fertilizer and let’s plant some indoor herbs. An herb garden can bring some of nature indoors for either those dull, lifeless winter months or add to your indoor vegetable garden. This can be done by using hydroponics or soil. There are some really good indoor growing systems to grow indoor herbs or vegetables, but that’s on a different page. We’re focusing on growing herbs indoors. To get started you will need to provide good soil, drainage, and air movement, humidity from growing herbs close together in groups, and most importantly light. Sunlight, Gro Lux lights, or other indoor growing light systems you can use. All sages can be grown indoors with sunlight, but the best one to cultivate indoors is “Pineapple sage and Prostrate sage”. •	Aloe Vera, A. barbadensis - An easy to grow herb for your indoor herb garden and can tolerate cold temperatures to 41 degrees F minimum. •	Bay, Laurus nobilis - Trim into a ball for a great overall visual appeal and health for the small tree. •	Borage, Borago officinalis - My favorite for indoors or outdoors. Simply a beautiful, tasty herb to grow for your indoor herb garden. •	Chives, Allium schoenoprasum - Tasty, easy to care for, give it a trim for continual growth for fresh herbs. A low maintenance herb. •	Geraniums, Pelargonium species – Grow in pots and then bring indoors with a severe pruning before bringing inside for winter. •	Golden hop, Humulus lupulus, ‘Aureus’ - This herb is to train to grow around a window frame or tripod. •	Golden marjoram, Origanum vulgare, ‘Aureum’ - With this mild, savory tasting herb, but be careful of too much sun as it will scorch the delicate leaves. •	Lungwort, Pulmonaria officinalis - This herb has pink to purplish-blue flowers and can tolerate low light, as it’s usually grown in the shade outdoors. •	Nasturtium, Tropaeolum majus - Another vine growing herb and easy to train to grow up and around your window herb garden. •	Rosemary, Rosmarinus - Nurture this tender evergreen perennial in a container grown in a sunny indoor herb garden. •	Salad burnet, Poterium sanguisorba - Grow this herb in salads along with other lettuce varieties. •	Sorrel, Rumex acetosa - Beautiful to grow this leafy green herb to use like spinach. 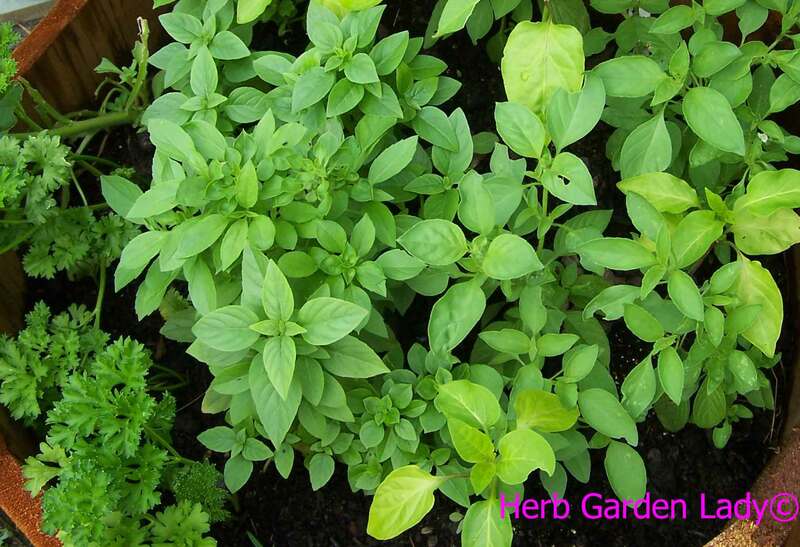 •	Sweet basil, Ocimum basilicum - An excellent, easily grown indoor plant. •	Tarragon, Artemisia dracunculus - Aromatic and great for growing an indoor herb garden with you indoor garden.